Omega Centauri has been known as an unusual globular cluster for a long time. A new result obtained by the NASA/ESA Hubble Space Telescope and the Gemini Observatory reveals that the explanation behind omega Centauri's peculiarities may be a black hole hidden in its centre. One implication of the discovery is that it is very likely that omega Centauri is not a globular cluster at all, but a dwarf galaxy stripped of its outer stars, as some scientists have suspected for a few years. Omega Centauri is the largest and brightest globular cluster in the sky. Images obtained with the Advanced Camera for Surveys onboard the NASA/ESA Hubble Space Telescope and data obtained by the GMOS spectrograph on the Gemini South telescope in Chile show that omega Centauri appears to harbour an elusive intermediate-mass black hole in its centre. "This result shows that there is a continuous range of masses for black holes, from supermassive, to intermediate-mass, to small stellar mass types," explained astronomer Eva Noyola of the Max-Planck Institute for Extraterrestrial Physics in Garching, Germany, and leader of the team that made the discovery. Omega Centauri is visible from Earth with the naked eye and is one of the favourite celestial objects for stargazers from the southern hemisphere. Although the cluster is 17 000 light-years away, located just above the plane of the Milky Way, it appears almost as large as the full Moon when the cluster is seen from a dark rural area. Exactly how omega Centauri should be classified has always been a contentious topic. It was first listed in Ptolemy's catalogue nearly two thousand years ago as a single star. Edmond Halley reported it as a nebula in 1677. In the 1830s the English astronomer John Herschel was the first to recognise it as a globular cluster. Now, more than a century later, this new result suggests omega Centauri is not a globular cluster at all, but a dwarf galaxy stripped of its outer stars. Globular clusters consist of up to one million old stars tightly bound by gravity and are found in the outskirts of many galaxies including our own. 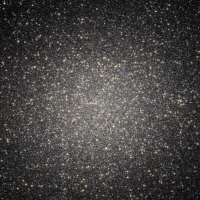 Omega Centauri has several characteristics that distinguish it from other globular clusters: it rotates faster than a run-of-the-mill globular cluster, its shape is highly flattened and it consists of several generations of stars – opposed to more typical globular clusters that usually consist of just one generation of old stars. Moreover, omega Centauri is about ten times as massive as other big globular clusters, almost as massive as a small galaxy. These peculiarities have led astronomers to suggest that omega Centauri may not be a globular cluster at all, but a dwarf galaxy stripped of its outer stars by an earlier encounter with the Milky Way. "Finding a black hole at the heart of omega Centauri could have profound implications for our understanding of its past interaction with the Milky Way,” said Noyola. Eva Noyola and her colleagues measured the motions and brightnesses of the stars at the centre of omega Centauri. The measured velocities of the stars in the centre are related to the total mass of the cluster and are found to be far higher than expected from the mass deduced from the number and type of stars seen. So, there had to be something extraordinarily massive (and invisible) at the centre of the cluster responsible for the fast-swirling stars - almost certainly a black hole with a mass of 40 000 solar masses. "Before this observation, we had only one example of an intermediate-mass black hole - in the globular cluster G1, in the nearby Andromeda Galaxy,” said astronomer Karl Gebhardt of the University of Texas at Austin, USA, and a member of the team that made the discovery. Although the presence of an intermediate-mass black hole is the most likely reason for the stellar speedway near the cluster's centre, astronomers have analysed a couple of other possible causes: a collection of unseen burnt-out stars such as white dwarfs or neutron stars adding extra mass, or a group of stars with elongated orbits that would make the stars closest to the centre appear to speed up. According to Noyola these alternative scenarios are unlikely: "The normal evolution of a star cluster like omega Centauri should not end up with stars behaving in those ways. Even if we assume that either scenario did happen somehow, both configurations are expected to be very short-lived. A clump of burnt-out stars, for example, is expected to move farther away from the cluster centre quickly. For stars with elongated orbits, these orbits are expected to become circular very quickly." According to scientists, these intermediate-mass black holes could turn out to be baby supermassive black holes. "We may be on the verge of uncovering one possible mechanism for the formation of supermassive black holes. Intermediate-mass black holes like this could be the seeds of full-sized supermassive black holes." Astronomers have debated the existence of intermediate-mass black holes because they have not found strong evidence for them and there is no widely accepted mechanism for how they could form. They have ample evidence that small black holes of a few solar masses are produced when giant stars die. There is similar evidence that supermassive black holes weighing the equivalent of millions to thousands of millions of solar masses sit at the heart of many galaxies, including our own Milky Way. Intermediate-mass black holes may be rare and exist only in former dwarf galaxies that have been stripped of their outer stars, but they could also be more common than expected, existing at the centres of globular clusters as well. A previous Hubble survey of supermassive black holes and their host galaxies showed a correlation between the mass of a black hole and that of its host. Astronomers estimate that the mass of the dwarf galaxy that may have been the precursor of omega Centauri was roughly 10 million solar masses. If lower mass galaxies obey the same rule as more massive galaxies that host supermassive black holes, then the mass of omega Centauri does match that of its black hole. The team will use the European Southern Observatory's Very Large Telescope in Paranal, Chile to conduct follow-up observations of the velocity of the stars near the cluster's centre to confirm the discovery. The finding will be published in the April 10 issue of the Astrophysical Journal in a paper titled "Gemini and Hubble Space Telescope Evidence for an Intermediate Mass Black Hole in omega Centauri" by Eva Noyola (Max Planck Institute for Astrophysics in Germany & University of Texas, USA), Karl Gebhardt (University of Texas) and Marcel Bergmann (Gemini Observatory).